Kitti’s Hog-nosed bat ( the bumblebee bat) is an endangered bat with a total population of about 4000 and is the world smallest mammal. It has a length of 1.1-1.3 inches, a wingspan of 6-7 inches, and a weight of only 2 grams. This endangered creature is limited to living in limestone caves typically near rivers, in colonies of anywhere between 10-100 individuals. The Bumblebee bat’s flight time is usually only 20-30 minutes and and they stay within a mile radius of their home when foraging for food. It is hard for us to understand what the evolution process has been like for the bumblebee bat. They certainly branched off from the other bats at some point, but it is uncertain where or when since there are no fossil records. 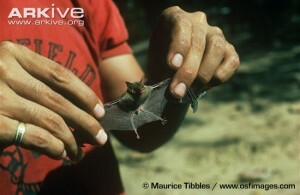 Despite its small size, the bat has very strong legs and claws. They have a tendon locking mechanism in their toes that allows them to roost while expending very little energy. Experts have wondered how this creature is capable of flight with such bizarre dimensions. Its wingspan is fairly large in proportion to its body, which weighs less than a penny. There is also extra webbing between the hind legs in this species of bat and this enables them to fly and effectively control their flight. I see a theme here: you started with the largest bird (the Argentavis), then posted on the tiniest flying insect, and now the smallest flying mammal.